Microsoft has invented a new method of work place communication: Microsoft GigJam is designed to help work groups collaborate quickly and efficiently across devices and applications. Here’s how you use GigJam: You pull business data from a number of sources such as Salesforce, Outlook, Microsoft Office 365 or LinkedIn by typing, or by simply telling Cortana what you want. Once you have the data in GigJam, you can use the mouse or your finger to circle what you want to include and cross out anything you don’t want to share.When you invite others to work with you, GigJam only allows them to see what you selected to share. Other users can edit, add content, and send information back to the group. GigJam is designed to provide a bit privacy than just broadcasting your entire desktop to a coworker; you control what gets shared. Plus it’s more productive than e-mail, since you don’t need to waste time taking screenshots or copying and pasting the relevant data into a message. With GigJam, you just pull up your stuff, choose what you want to share, and go! 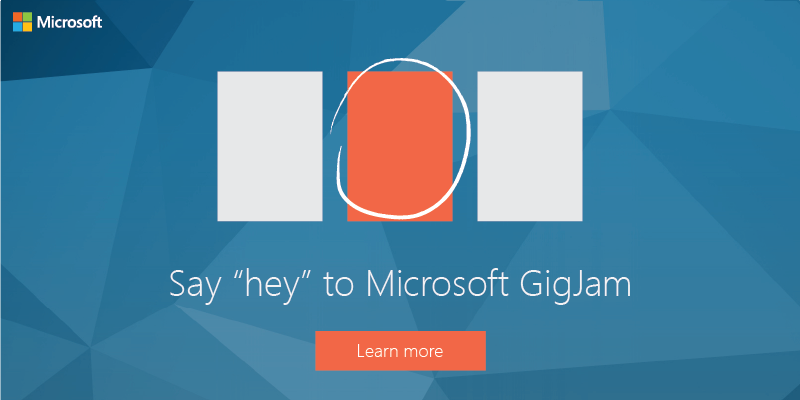 Visit Microsoft’s GigJam site to learn more about the application. Make sure to sign up for exclusive access to Microsoft GigJam and know when the public preview version is available for download.